A fantasy novel about police officer Joanne Walker (birth name Siobhan Walkingstick) who lives in Seattle. Her life went awry when she learned to her dismay that she is a shaman. Something is not right in Seattle and its up to Joanne to set it straight. Through out this book Joanne struggles against accepting her gift. She doesn't want it and she doesn't want the responsibility that comes with accepting it. You can easily read this book without having read the first one, though there are a number of references back to previous events. It would have been interesting to know what had happened and how she came to realize that she is a shaman. 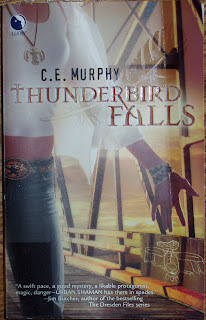 You can check Ms. Murphy's website for her other novels that sound equally interesting. As a side note, Joanne has taken up fencing as a means of dealing with the stress in her life after she was stabbed through with a sword in the previous novel in this series. Since I have started fencing I am compiling a list of fencing related novels.